We had lot of fun planning my daughter's Mermaid Party this summer at a local pool. This cute Pixie Mermaid invitation from Picture Perfect served as an inspiration for the rest of the party. Food: A colorful goldfish/raisin snack mix combo, cut fruit, and the party cupcakes all served with Blue Hawaiian Punch for the kids and lemonade for the adults. I found awesome cupcake toppers from Gaddie and Tood. They are beautifully handmade and looked so festive on the tiered cupcake stand. Decorations and Favors: Blue and green streamers were hung from the pergola. Blue tablecloths covered the picnic tables and were scattered with seashells. The birthday girl had fun picking out coordinating blue and green cups, plates and napkins. (She may just have a future as a party planner!) Guests received small cello bags with a small sea life coloring book and crayons as a thank you. Activities: Using shells gathered from trips to the beach, kids were able to string their own shell necklace. Everyone got either a mermaid or pirate tattoo. Pool games included hunting for "gold" coins along the bottom of the pool and relay races while walking with flippers. Finally, using an idea from Family Fun Magazine, the birthday girl made her own Mermaid Princess Crown to wear for the party. 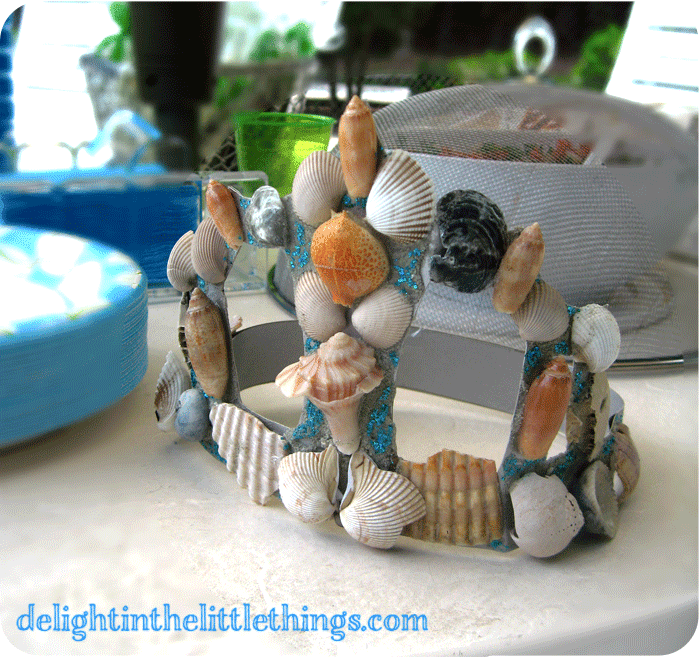 Easy-peasy, just some poster board cut into a crown shape by me, some tacky glue to hold down shells from the beach and blue glitter. It was certainly a statement piece! What are some of your favorite ideas for hosting a mermaid party? 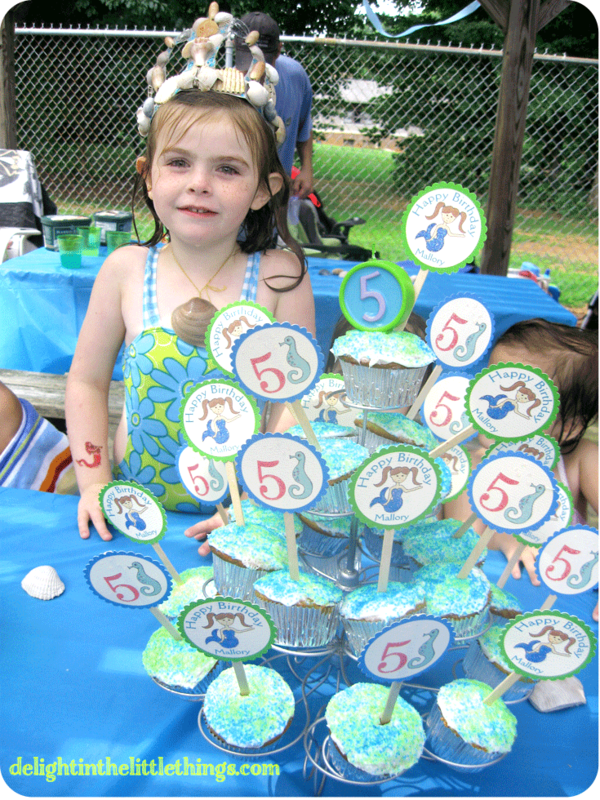 Follow Sassafras Paper's board a mermaid / pool party on Pinterest.